I keep kicking myself that I constantly postponed reading J.R.R. Tolkien's classic Lord Of The Rings books. Now after seeing this incredible film, there would be little left for my imagination to create as this phenomenal cinematic accomplishment pays so much attention to detail that my brain will merely refer to the memory of it when encountering the situations in print. Be that as it may, those who miss out on seeing this masterpiece will be as poor as I who missed out on reading it. Tolkien's Middle Earth is a world inhabited by good, evil, human, goblin, hobbit, troll and elf. Magic is a reality and one particular piece of magic with a very dark lining was forged into a ring, which in the hand of its evil master will cover the world with darkness. It is up to a young hobbit and a band of assorted assistants, true of heart, to take this ring and destroy it in the fires of Mount Doom before its master's monstrous servants get to it. Their quest is a hard one with many obstacles, danger and perilous encounters that may cost any or all of their lives in the blink of an eye. It's one heck of a ride. 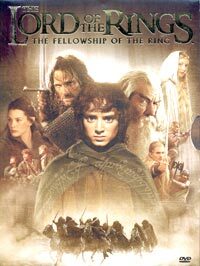 The Tolkien trilogy was shot back to back over a period of two years, the consecutive sequels to be released annually. An extremely talented and technically brilliant production team integrated optical and digital effects with live action with a virtually seamless beauty, and for hardly a moment do you look at the amazing world created on screen as "fake". Those who feel the need to bring up Harry Potter comparisons other than the ginormous anticipation factor of both films, can forget about it, as it's two vastly different films with Lord overshadowing Potter in almost every aspect, the latter far more a kiddies movie than the more adult subject of discussion. To be able to own such an awe-inspiring cinematic work is quite something. This first DVD release comes in a digi-pak containing 2 discs with a nice little extras package, including a look at its creation and interviews with stars, director and technical staff on the enormous task to commit this enthralling tale to celluloid, from inception to the final product. Theres a look at the development of the computer game and more. True collectors will get this one anyway, but a special 4-disc edition will also be available towards the end of the year including the director's cut and loads more extras bits. But, even if there were no extras on this particular release, the fact that it is presented in widescreen format is rewarding enough - watching this film in any other cropped & chopped way borders on sacrilege. It's still quite a kick knowing that this, one of the most immense trilogies in film history was directed by Peter Jackson, the same New Zealand director who made the gory laugh riots Bad Taste and Braindead (aka DeadAlive)! Miss this and you truly miss out.